Rogers Marvel Architects restores McCarren Park Pool. No diving. 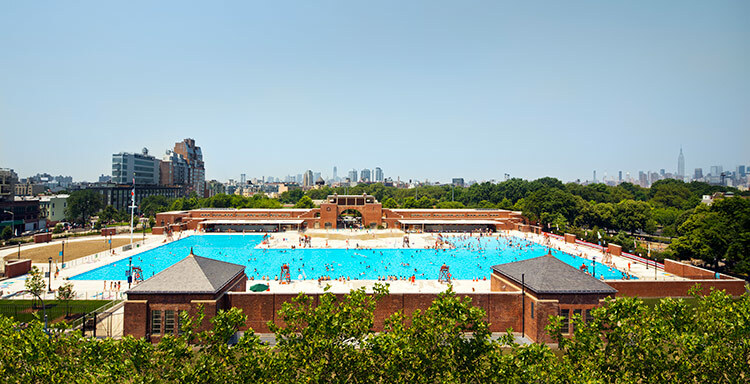 That’s the rule in most all of the 50 public outdoor swimming pools of New York City, including the McCarren Park Pool between Greenpoint and Williamsburg in Brooklyn. 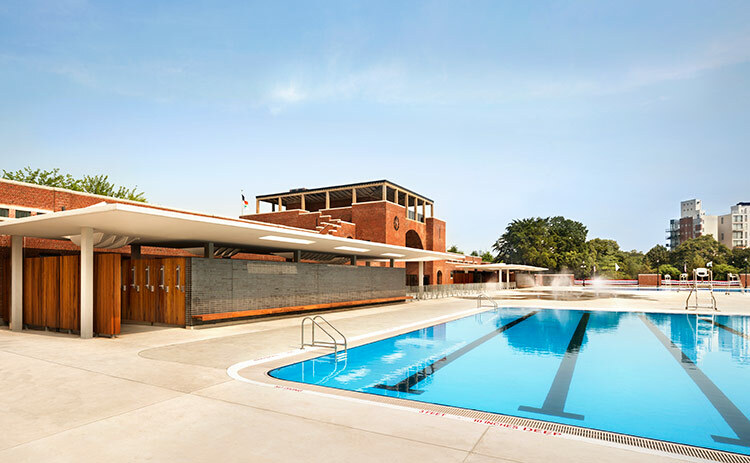 The pool was recently reopened with a $50 million renovation by Rogers Marvel Architects after a near-30-year dry spell. And yet there’s something about the new outdoor changing pavilions, the most visible part of the renovation that has all the poised tensile exuberance of a leap into space. Their white, plastery canopies narrow in profile, diving-board-like, toward their perimeters—the soffits tilting up more gradually poolside, more steeply behind—and their supporting columns are similarly skinnier closer to the water and stouter closer to the existing building—reinforcing an impression of embodied and potential energy. 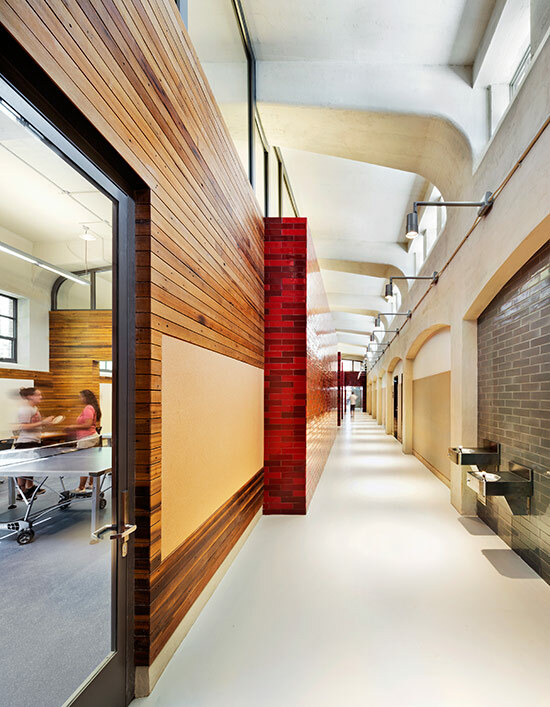 Incisions and gill-like fins guide daylight into the interiors, and a generous gap between the underside of the canopies and the top of the partitions and lockers below bring sparkle and spaciousness to what would otherwise be dour transitional spaces. Some of those spaces are elegantly prosaic, like computer labs, meeting rooms, and small-scale gymnasiums tucked into the existing no-nonsense bar buildings that flank Embury’s fantastical arch. The pool itself, once a massive rectangle with enough water for four Olympic-size facilities, has been reconceived with a central peninsula (an ice rink in winter) that configures the now C-shaped complex into a sloping inlet for kids, a 25-meter-long area for laps and lanes, and a big expanse for everything else. Fountains and mist machines turn that central peninsula into an uncanny beach. A subtle arrangement of gates and fences allows parallel indoor-outdoor circulation for swimmers and patrons of the community facilities. Some of the spaces are more poetic, like the restored atrium inside the entrance pavilion topped by a skylight worthy of James Turrell, or the adjacent moody lobbies, lined in horizontal hardwood boards salvaged from Coney Island’s demolished boardwalk. 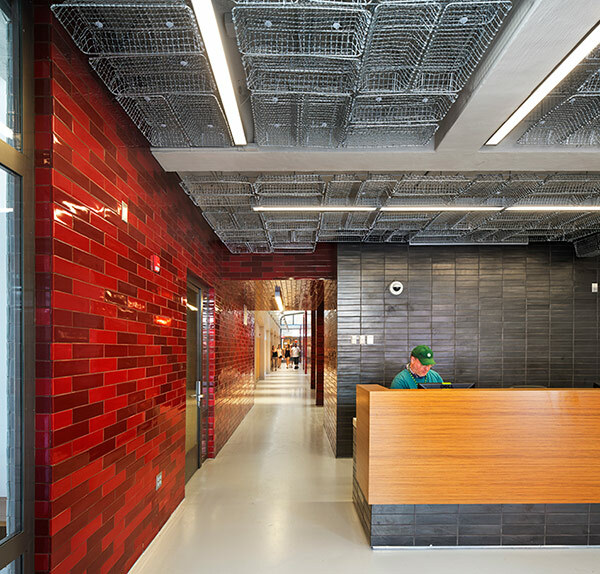 In another charming instance of adaptive reuse, hundreds of baskets, recovered during construction and that once stored swimmers’ clothes and belongings, are now inverted and affixed to the lobby ceilings in a shimmering metallic matrix. Those overturned baskets send you on a different kind of dive, swooning deep through the history of the city: it’s easy to see descending from them, in the mind’s eye, decades of shoes and glasses, treasures and trinkets, cascading through almost a century of summer. Rogers Marvel Architects, in projects like Upper Manhattan’s Stephen Gaynor School at one scale and the Mulberry Street Branch of the New York Public Library at another, have demonstrated an increasing interest in the dignity to be found in public space and civic life, and the thoughtful infill to be discovered between old and new. That’s all too rare in a New York firm, and indicates a practice that, despite its admirable formal restraint and drily understated style, is ready to make a bigger splash.